MAXILLARY EXPANSION APPLIANCE (MEA) – A fixed appliance that is used to skeletally expand the upper arch. This appliances is typically used in adolescents to correct crossbites and narrow arches. Skeletal expansion becomes more difficult with age and should be done prior to puberty to avoid an expensive surgical procedure. Quite often this requires an early stage of treatment between 7 and 9 years of age. CLASS II CORRECTORS (SPRINGS) – This appliance is attached to the braces between the upper and lower arches to reduce excess overjet by pulling the upper teeth back and moving the bottom teeth forward. This eliminate the need for extractions and/or headgear. SPACE MAINTAINERS – This is a fixed appliance that is typically used when primary teeth have been extracted prematurely. They are used to hold space until permanent teeth erupt. 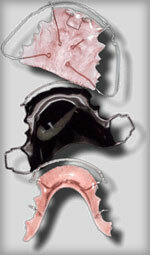 SPRING RETAINERS – This is a removable appliance that is used to correct minor alignment issues. This appliance needs to be worn 24/7 in order to achieve the desired result. Removable appliances require care. Although you may notice an effect on speaking along with an increase in the flow of saliva, you will eventually adjust to the appliance. The appliance can be worn 12/7 after the teeth have shifted to maintain the end result.